I was looking into the twitchy EVO steering setup on my mom's 99 Tahoe again the other day. I put in the first replacement wheel position sensor a few years back (circa 2007), which was a genuine GM part from the dealer. That one cleared up the twitch for a while (although there was still some slight hint of it there), but within a few months (yes, months) the problem returned. I put in a sensor from the "Help!" section of the local parts store and that one also failed within 6 months. I warrantied out that one and got another one. That one has been in there for over a year and a half. The twitch is returning with a vengeance. Getting sick of this. I've even read of this supposedly causing some accidents. I don;t know how true that is, but I can see how it certainly could. I had determined that it is was actually the solenoid itself on the back of the pump which is still causing issues, but when I looked into it, GM had discontinued the solenoid. Great. At that point, my mindset was to get rid of the system completely by swapping out the solenoid for the old fitting on the back of a 96 model pump I have laying around. The trucks call for the same pump part number for 96 and 99, you just swap in your existing EVO solenoid. I would also have to change over to the old high-pressure hose assembly so that it would bolt up, but that's no big deal. It appears GM is in agreement with me on this... I found out on another forum that GM #19168825 is a kit made to replace the EVO solenoid on the pump with a fixed-orifice fitting similar to the old pumps. Since I could find no pics of the kit online, I looked at one at my local dealership, and the main difference I see between this and the older fitting is that this one has a piece of c-shaped tubing made into it to make it line up and connect to the existing hard line assembly on EVO-equipped trucks (98 and up). This would negate the need to swap in a high-pressure line from an older truck. GMPD shows a list price of $77.58 and my local dealer was selling it for $60. I'm debating which way to go on this. I was about to rebuild this 99 Tahoe pump anyway due to a front seal leak (118,000 miles), so I could probably just rob the old style fitting out of my spare 96 pump to perform the retrofit. I was of the mindset to put fresh hoses on the truck anyway, so I would just need to get them for an earlier, non-EVO application. This would save me the cost of the new retrofit kit mentioned above, which is a bit steep for what it is. I did not find it available in Delco, and I looked on Rock Auto, eBay, etc. to no avail. Looks like a dealer only item. Point is, I just wanted to make everyone aware of this kit. If you're sick of the EVO woes and want to eliminate it for good (without the trouble of tearing into your existing pump or swapping hoses), GM now sells a kit to do just that. BTW, since I'm thinking about it (looking up pumps and cross-referencing them, etc. ), I wanted to offer up a personal suggestion as to replacement pumps: stay away from A-1 Cardone. Last summer, I had to replace the pump on my old beater 89 Toyota pickup, replacing the 300,000+ mileage original pump. I installed an A-1 Cardone reman. since I was in a pinch and couldn't find anything else. The pump on these trucks uses a keyed shaft and pulley (like a crankshaft snout), and the shaft had wallowed out around the keyway... sounded like a rod knocking. As soon as I installed the Cardone pump, it whined from the get go, even after thoroughly purging any and all air from the lines. After a month of driving around sounding like this little turd-mobile had a supercharger, I ordered up an AC-Delco reman. pump (cost twice as much as the Cardone, but was worth it), yanked the Cardone, and turned it in for core. The Delco pump was quiet from the start and has been perfect for over a year now. Since these Toyota pumps of this vintage are vane pumps just like our Saginaw units on our GM trucks, I'm confident we might be susceptible to this same problem. From what I read, pumps which whine incessantly like this one did have become worn on the outer areas of the casting where the vanes ride on their outer edges. These rippled areas in the casting create some unusual turbulence around the vanes and the whining is the result. During the reman. process, the casting should be machined slightly so that these surface regularities are removed, providing a good surface for the vanes to interact with. Obviously, not all companies do this critical step while re-manufacturing pumps. Since the Saginaw pump on the 99 Tahoe I mentioned in the previous post is the original one, I know the entire history of it. Since I have run synthetic fluid in it since it was new (switched over shortly after the truck was bought), I change it on a regular basis (obsessive, yes), and since it presently makes no noise at all, I'm going to rebuild it myself. It should be in superb shape internally, so I think it to be a good candidate for a DIY rebuild. If I suspected it needed machining to true up the housing surfaces, I wouldn't bother with the rebuild, but would just turn it in for core. The Delco rebuild kit was only about $15, so I figured it couldn't hurt to give it a try and see how it turns out. So, bottom line... all reman. PS pumps are not created equal. I would suggest the AC-Delco variety whole heartedly over Cardone. you know, i never gave much thought to the pump on my truck and it survived since it came off the line with well over half a million miles on it. it had that twitch in it about year 3 or 4 - somewhere around 150k, but when i did my head gaskets and removed the brackets and let them lay - when i put it back together, the twitch went away. im sure i just banged it in the right spot or something - but it has never returned. i never changed the fluid either - not saying thats a good thing. just made sure it was topped off and called it good. never leaked, never made noises - a tank of a pump. i can see how the twitch could cause an accident though - on more than one instance while driving in the Virginia beach area, with the smooth sweeping curves, about half way through the turn (the apex, if you will) is about when it would twitch causing a diving motion. it became somewhat predictable, but i could see where it could be an issue with either someone not expecting it, or not paying attention. it usually only did it between 12 O'clock and 3 or 9 O'clock wheel position while going around curves at highway speeds, never had much issue on surface streets. I'm going to try this thing out. I thought I would have to change out the steering gear if i eliminated the variable assist steering. Looks like you don't if GM has this EVO eliminating kit. Also I recently changed my ps pump when I did the hydroboost and it been whining ever since. Its a AC delco reman but I think there is something wrong with it. Also the paint they used to coat the reservoir has almost completely flaked off. My stock one held up better and was still good when I took it off at 150K miles just because I wanted a hydroboost version. I have a pump and reservoir off of the 06 LQ4 engine I have in my garage. I might bolt this one up if its the same pump. After doing some searching, I found the installation instructions on FSC. you know i had the EVO on my 98 and all i did was un plug the PWM plug on the powersteering pump and it just had easy steer all the time. i had the crazy steering changing while driving so i unplugged it, from what i have found, the easy steer is in the steering box and has the varible orface valve on the powersteering pump that limits the flow of fluid by a PWM signal while driving to give different steering efforts at speed and while stopped. i also put a steering box from a 98 on a 95 tahoe and it had such easy steering cause the power steering pump was pushing full force all the time. this system works from a valve on the power steering pump. without the valve the power steering is really easy, if you want to ditch the EVO and dont want your vehicle to easy steer all the time just un plug the PWM valve and get a steering box from a 93-96 truck. I installed this bypass about a year ago. Best steering improvement I could have done. I just did an EVO bypass on my 1998 this past weekend. I kept the stock 1998 pump. I used the 26009894 fitting for the PS pump in place of the old EVO solonoid and a Gates 353950 PS pressure line. Both parts are stock 1996 parts. My steering wasnt "twitchy" as some described but wandered all over the place at highway speeds. I was hoping that results after the change would make the steering stiffer as well. It did not. I have already adjusted the gear box nut as much as I feel I can. There is very little play in turning the wheel until you feel the resistance feedback from the steering unit. I would some how like to dial down the amount of assist that the unit develops. I would prefer a tighter, stiffer unit as an ant could still turn the wheels in a parking lot. Any ideas on how to stiffen this thing up? I have 275/55/20's on it as well. Ball joints, tierod ends, idler, pitman arm and centerlink are all Moog Problem Solver units and had zero affect on the behavior of the steering. Quick answer... will try to post pics later when I get a chance. Was planning to do a write-up on this but have not gotten to it yet. This is exactly what I will be doing probably next month when I get my mom's Tahoe back down to my house to do some more work on it. The EVO delete completely solved the twitch as expected, but I (like you) would prefer less boost, as the steering (although tight) still feels "wandery" on the highway, which is especially unnerving in a large vehicle like a 4wd Tahoe. These Saginaw pumps have been around forever, and there is a way to easily adjust the boost they provide. Did A LOT of research online into this, and it has to do with the flow control valve inside the pump. This is NOT to be confused with the flow control FITTING which is what threads into the back of the pump in place of the EVO solenoid assembly when retrofitting back to the pre-97 style of steering assist. Behind that fitting is a spring, and behind that spring is the flow control valve. This valve has a hex nut on the end which is epoxed into place on later style units (my 96 was epoxied, so anything we'r working on here will most likely be as well). Way back in the day, they were not epoxied into place. The amount this hex nut is tightend down onto the fitting controls the pump's output and thus the amount of steering assist. GM sets the clearance on these at .024" on these trucks. They set the hex nut and the epoxy holds it in place. It used to be that they used shims under the fitting to set this clearance, but in modern times they just tighten down the nut to the set clearance and let the epoxy hold it there. This hex nut applies a pre-load to a spring-loaded check valve assembly inside the flow control valve, so how tight or loose this hex nut is will determine that preload pressure... this is quantified by the clearance from the base of the nut to the end of the flow control housing. Without a power steering pressure gauge, it is somewhat a matter of guesswork to determine what the clearance needs to be reset to in order to provide the desired boost level. If you want MORE boost, then tighten down the hex nut (less clearance), but since we are wanting LESS boost, we need to be shimming the hex nut out. One could conceivably remove the hex nut (difficult because of the epoxy but do-able without damaging the spools on the valve), put some threadlock on it, and tighten back down to the desired clearance using a flat feeler gauge (go, no-go) to check the clearance, somewhat like checking spark plug gap. Based off some readings I found in a magazine article online, with the stock .024" clearance, the pump is putting out about 1,400 psi. Moving up to .077" clearance yields an output of about 800-850 psi, for a difference of 600 psi. The difference in the shim (.077" - .024") comes out to be .053", so given that figure I concluded that a ballpark figure would be about 11.3 psi reduction in pressure for every .001" of clearance. Again, these pressure readings are theoretical, as I have not read actual pressures off of one of these trucks with a gauge myself, but I'm using the above info as a baseline for my own experiments. I was planning to use shims instead of the threadlock/epoxy method to set the valve, so I located a hot rod shop out in California which sells kits to re-shim these Saginaw boxes and even comes with a special jig you put the flow control valve into which helps keep you from damaging it while disassembling it. The kit was arund $20, and it included the shims and the jig. I was planning to take the valve apart and put in enough shims to bring the clearance out to .048"-.050", or approximately double the factory setting, which should bring pressure down about 270 psi according to the calculations in the previous paragraph. I have not done this yet though, so I was going to test all this out before posting here so that I could speak more authoritatively about the procedure. Wow! thanks, that all makes perfect sense. What is the place that sells the jigs and shims? I would like to try this as well. Alternatively I wonder if the 88-95 pumps have a different setting? I dont remember my 88 and 92 being this easy to steer! Here is a link to "Bill's Hot Rod Company" which is where I bought the shim kit. It's at the bottom left of the page, part number 1001. They only take orders by phone. It's an independent operation, and the guy I spoke with on the phone was very cool. Nice people, so I can wholeheartedly recommend them. Again, the shim route is optional... one could easily adjust the nut where they want it and rely on threadlock to hold it there. I'm sure GM decided to forego the shims many years ago and opt for the epoxy as a cost-cutting measure, but I like the idea of the shims, so that's the way I'm going. As a sidenote, the flow control valve is ONLY available from GM as an assembly, as none of the parts within such as the spring, checkball, etc. can be purchased separately. The entire valve is GM #7809221 and is about $46. It is the same number for 2wd and 4wd trucks, SUVs, etc. As mentioned earlier, I have not gone back into the pump to perform this adjustment myself yet, so I have not yet tested this. That's why I was waiting to post all this until after the work was done. With that being said, I need to insert "caveat emptor" and say that anyone performing these mods does so at his/her own risk. Since this is steering related (and thus a safety concern), I would recommend proceeding with caution. Most on this forum are well capable of doing this kind of mod, but I feel as though I need to cover my rear and release myself from any possible hint of liability in the case of someone less experienced doing this (being that this forum can be read by anyone, not just members) and then hurting themselves or someone else. So, there it is... proceed with caution and at your own risk. Awesome! here is another thread that talks about the same thing. 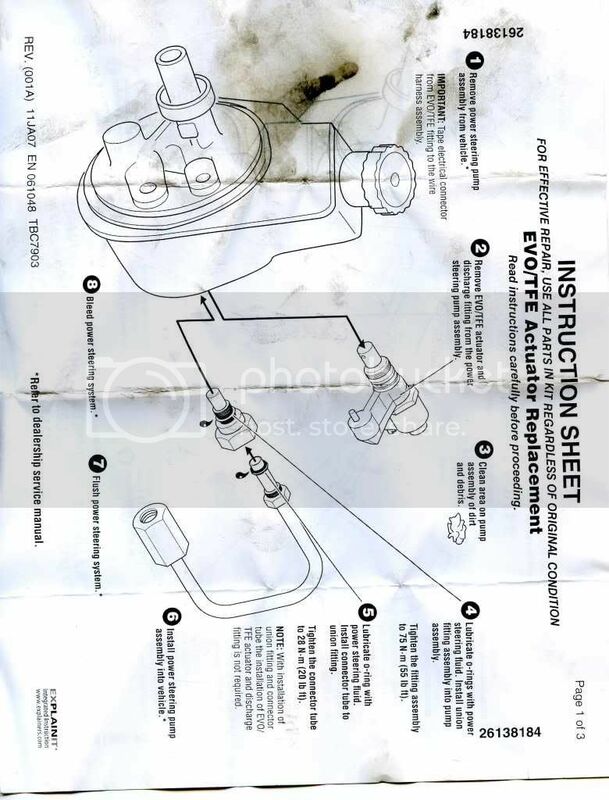 It also has a pic of the pump and where that flow control valve is behing dhe fitting. Interesting. You can alter the amount of change in assist by the number of shims used. I always thought that the amount of assist vs speed was hard fixed by the parts, ie not changeable by anyone, but you just gave anyone wanting to run EVO the means to adjust how much or how little assist there is. I wonder what the effect of increasing or decreasing the shims would be. Adding or increasing shims by limiting the distance that hex nut is "screwed in" will decrease pressure or assist. Removing shims or tightening down that hex nut will increase the pressure or assist. Deleting the EVO will give you a constant assist, where as decreasing the pressure in the flow valve and retaining EVO would be the best of both worlds. I just deleted the EVo and want a firmer feel. My camaro is almost too stiff, and the impala is just about right, the truck always has had too much assist. I don't know about the 88 or 92 models, but I can say for sure the pump from my 96 pickup (which I rebuilt and installed on the 99 Tahoe) had a setting of .024" from the factory, and when I disassembled the old pump off of the 99 Tahoe (original, untouched OEM piece), the setting on its valve was also .024" exactly. So, no difference in the flow control valve settings between EVO and non-EVO trucks, at least within the 96-99 model years. I tried the EVO bypass kit last week after we scanned my computer with my mechanics new scan tool. He found that the EVO was reading fluctuating milliamps. The EVO override did little or nothing. (by the way one of the first things I did last year was replace the EVO sensor under the dash. That did nothing. Then I read this and I tried 4 shims. This also made practically no difference. I have a 2002 Tahoe, all front end parts seem tight when checked on the lift by 2 different mechanics. I just put new Bridgestone REVO II AT tires on (stock Tahoe size), and just had the alignment done. I hate this overassisted 86 Cadillac feel but I love this truck otherwise. I'm spending money throwing parts at this problem and getting annoyed. I've been all over different Tahoe forums, have heard everything from tires to shocks to alignment to people adding an offroad steering stabilizer. I think next I'll try a different steering pump, after that I'll try a stabilizer or a gear box. I really hope this steering system can be tightened up. Anyone REALLY been successful at getting a tighter controlled feel in their steering? I will say, when I first got the truck last year it had crappy tires, and it was all over the road when windy so the things I've done have improved it, however I am not at all satisfied with this over assist feel.